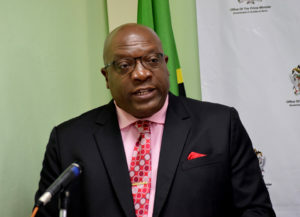 Basseterre, St. Kitts – The Prime Minister of St. Kitts and Nevis the Honourable Dr. Timothy Harris said his Team Unity administration is fully supportive of the local entities that have come on board to jointly fund the construction of the USD$48 million second cruise pier at Port Zante. 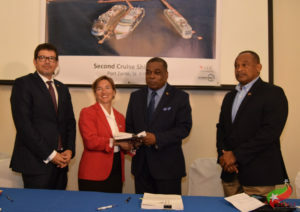 During a contract signing ceremony between the St. Christopher Air and Sea Ports Authority (SCASPA) and the prime contractor, Canadian Commercial Corporation (CCC), it was revealed that a syndicate arrangement between four local entities was chosen to undertake this project. The four financial players involved are the St. Kitts-Nevis-Anguilla National Bank (SKNANB), which has committed US$34 million; the St. Kitts and Nevis Social Security Board, which has pledged US$7 million; the St. Kitts and Nevis Sugar Industry Diversification Foundation (SIDF), with US$5 million; and the St. Kitts and Nevis Trading and Development Company (TDC), which has committed another US$2 million. Harris, who is also the minister of finance, further stated that the project is being funded by “credible institutions” with their own capacity to evaluate risks. The prime minister noted that the recent boom in cruise ship calls and passenger arrivals are indicative of the need for expansion at Port Zante, noting that the second pier is “perhaps one of the best investments that is being made in St. Kitts and Nevis. When you look at the outstanding numbers that are being recorded for cruise tourism, you know that the future for cruise tourism in St. Kitts and Nevis is very bright. Who would not want to cash in on that?” Dr. Harris questioned. For the 2017-2018 season, St. Kitts and Nevis is projected to receive a total of 569 cruise ship calls, bringing with them more than 1.5 million passengers. This represents a record for the twin-island federation. Work on the second cruise pier project is set to start by the end of the first quarter of 2018. The construction of the pier is expected to be completed within 18 months, in time for the 2019 cruise season.